This is an exquisite Christian necklace for men in sterling silver. The Black onyx cross pendant is a quality piece that is thick and substantial, making it a masculine cross pendant for men with style. The Black onyx cross pendant for men measures approx. 1 3/8" tall by 1" across and 2.5mm-2.9mm thick (1 11/16" tall with hoop/bale). 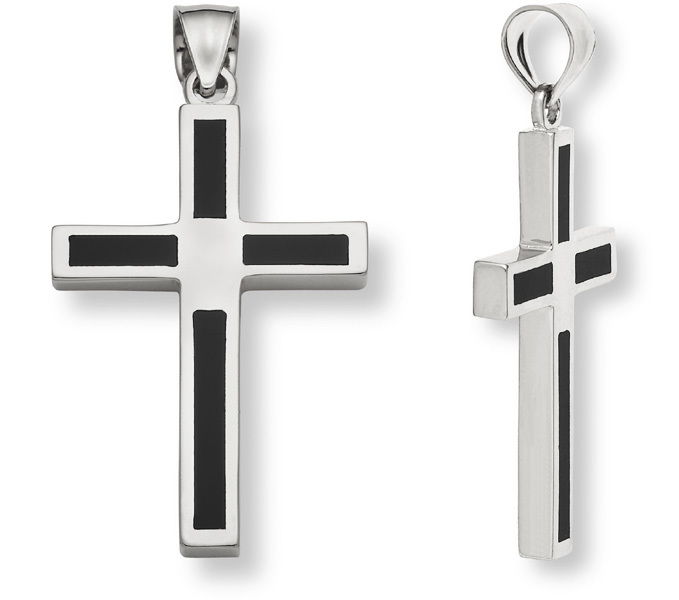 The stones are genuine black onyx inset into the .925 sterling silver cross. This men's Christian cross pendant is also available in 14k gold or white gold, shown below. Women's matching version also available, below. "Looking unto Jesus the author and finisher of [our] faith; who for the joy that was set before him endured the cross, despising the shame, and is set down at the right hand of the throne of God" (Hebrews 12:2). We guarantee our Sterling Silver Black Onyx Cross Pendant for Men to be high quality, authentic jewelry, as described above.